Aggregates and Averages—A Look at Changes in the Per-School Averages for European Schools Based on data reported in 2009-10, 2011-12, and 2013-14. When we look at the data reported on the annual AACSB surveys, we often examine it as a whole with aggregate sums across all of the participating schools based on specific characteristics or by looking at each individual school’s data separately. Taking a regional view is another way to drill down and examine the data that AACSB collects. Yet another interesting way to view this data is to take a look at the per-school averages based on those aggregate numbers to get a general idea of what the aggregate numbers could mean for individual schools. Of course, there will always be a range of responses, so an average cannot give the complete picture, but it does offer schools another benchmarking point to determine whether their school’s reported numbers are above or below the mean. All of the averages used in this article are based on the aggregate data from the following table collected from participating member schools in Europe on the annual Business School Questionnaire. For each of the education levels listed below, the graph shows the average number of applications, offers of admissions, entrants, enrolled students, and degrees conferred per school based on a controlled set of 44 European schools that participated in the annual Business School Questionnaire in all three years listed. Please note that not all schools that participated provided all data points for each year. The data table above displays the number of participating schools that provided each of these data points in each year listed. At this level, while the average number of applications has risen in each year, the averages for offers of admission, entrants, enrollments, and degrees conferred have all stayed relatively stable with small variations up or down. This could be caused by a number of factors, including the potential that some schools are seeing increased demand based on the number of applications received, but are already at capacity and haven’t increased the conversion of those applications to enrollments or that, despite receiving additional applications, the number of qualified applicants has remained largely the same. When looking at the aggregate data for this comparison group and time period, 31 schools reported a total of 67,378 applications at the master’s-generalist level in 2009–10, and 40 schools reported a total of 107,375 applicants in 2013–14. By looking at this on a per-school basis, you can see that the number of students applying at the master’s-generalist level has been on the rise, with a 27.0 percent increase in the average number of applications reported per school from 2009–10 to 2013–14 for this group of survey participants. A very interesting point on this figure is the close match between the number of new entrants and degrees conferred – showing that the average number of incoming and outgoing students per school tends to be similar. As both offers of admission and enrollments show an upward movement in 2013-14, the entrants and degrees conferred numbers may also begin to show growth in future years as these students continue through their programs. For master’s-specialist programs, the average number of applications has also increased, but, unlike the at master’s-generalist level, the average number of entrants is somewhat higher than the average number of degrees conferred. Especially when seen in conjunction with the continued increases in offers of admission and enrollments, this could indicate that schools are adding more capacity to their specialized master’s degree programs, which may lead to continued increased growth in these programs. Considering how to make better use of today's videoconferencing technology in the classroom? You're not alone. Of the nearly 40 schools with new or renovated facilities in 2012 (as listed in our business school facilities list), more than 70 percent report that the facilities support videoconferencing technology. Videoconferencing can open the door for cross campus collaboration, virtual field trips, and guest speakers at a fraction of the cost of travel. Examples of the variety of uses of videoconference technology abound. In 2011, the Wharton School upgraded its conference rooms by installing a 103 inch plasma display with integrated Polycom and Tandberg support (both videoconferencing providers). The Kenan-Flagler Business School also introduced a TelePresence suite last year in its Rizzo Conference Center. The Fuqua School of Business at Duke University opened its own lecture hall in early 2010 outfitted with videoconferencing technology. The American University of Sharjah (AUS) opened two auditoriums outfitted with high definition projectors and videoconferencing functionality. According to the news release pertaining to the auditoriums at AUS, the newly installed technology has largely been successful due to its ease of use. It no longer takes a trained technician to set-up a videoconference. In fact, in 2009, Georgetown spent $82.5 million USD on a new building for their business school, equipped with videoconferencing technology stations, designed for individual student use. The usage of this technology extends beyond the formalized lecture hall setting and can be taken advantage of on a much smaller scale. Baylor is providing its students with smaller scale videoconferencing options, similar to Georgetown, with a slight twist. 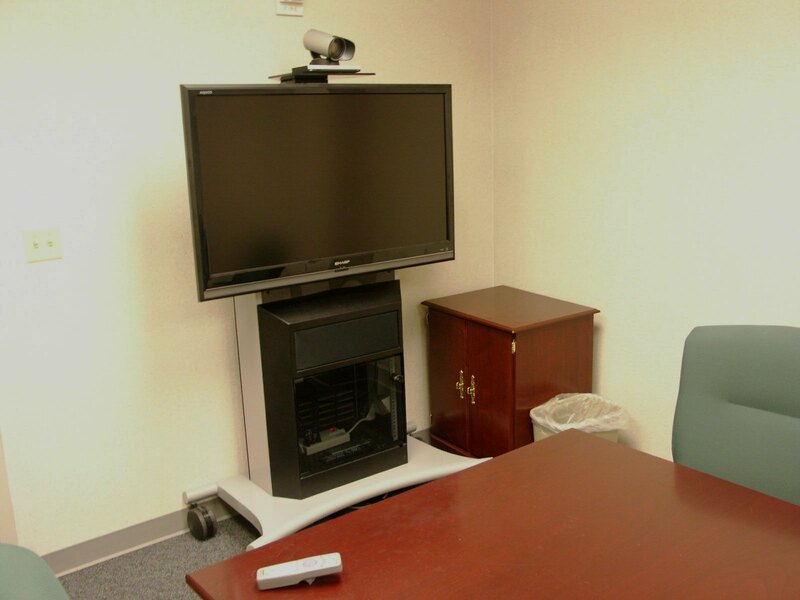 Baylor uses a mobilized cart unit equipped with Cisco Telepresence C20 and laptop inputs, to allow students to effectively establish a videoconference anywhere on campus with the appropriate outlets. Also at Baylor, a boardroom environment is simulated in their Financial Markets Center using a videoconferencing suite. According to Baylor, the technology in the center accounted for nearly half of the $900,000 USD spent to create the facility. The center serves multiple purposes for students, as it offers a setting ideal for financial research (with its dedicated stock ticker board), videoconferencing, and realistic board meeting simulations. INSEAD is using videoconferencing to help students land jobs. According to a 2010 post by Sandra Schwarzer, Director of Career Services, on INSEAD's MBA Experience blog, videoconferencing accounts for a healthy percentage of on campus interviewing. INSEAD's Career Services staff organize roughly 5,000 interviews in a given year, and approximately 800 of the first round interviews are conducted through videoconference. Schwarzer notes that students on other campuses or those on exchange at other universities can also participate, thanks to the videoconferencing technology. Videoconferencing can be used in a variety of different ways, as evidenced by the preceding examples. Some universities are morphing large auditoriums into functional videoconferencing centers, while others are shrinking its scale to the individual, and highly mobile, level. As new technologies continue to emerge and videoconferencing becomes more intuitive and advanced, it will be interesting to track how videoconferencing is further incorporated into the evolving business school landscape. Why the Growing Market Share of For-Profit Providers? Recently I pulled data from the U.S. Department of Education’s IPEDS Data Center for one of our member schools. The data had to do with the growing market share of for-profit business education providers at the master’s level. Though my colleague Dan LeClair has touched on this topic once before, the data I saw gave me a new point of view for this increase. Note: N = the total number of graduate-level business students enrolled in the given year. In 2000-01, 710 total institutions reported enrolling business graduate students, versus 1127 in 2008-09. Source: IPEDS Data Center. Enrollment in graduate-level business increased overall and in each sector, but the share of enrollment across sectors changed dramatically. It is interesting to note that the growth in for-profit providers’ market share in degrees conferred that Dan noted in his post primarily takes away from that previously held by private not-for-profit institutions. In the case of enrollments, however, it is public institutions that suffer the bulk of the losses in market share. There are a number of possible reasons for the growing market share of for-profit schools in these areas. For-profit schools often allocate far more resources for advertising and recruitment than public and private, not-for-profit institutions do (or can). Many for-profit institutions are seen, rightly or not, as having less stringent requirements with regard to admissions, faculty qualifications, curricula, etc., than other (particularly AACSB-accredited) schools. I should note here that, at this writing, there are no AACSB-accredited schools in the for-profit sector. Note: N includes all institutions reporting enrollment figures for both Full-time and Part-time graduate students in Business. Source: IPEDS Data Center. These numbers indicate that for-profit schools have significantly higher proportions of business graduate students enrolled full-time, which IPEDS defines as nine or more graduate credit hours per semester. This was quite unexpected, particularly considering that for-profit schools typically market themselves to working adults, who presumably must also contend with time management for their jobs in addition to their studies, and thus might be expected to gravitate more towards part-time study. From my perspective, then, this implies that it is easier for working adults (and likely others as well) to carry a full-time course load at for-profit institutions. If so, it would certainly explain, at least in part, the substantial increases in market share of enrollments at and degrees conferred by for-profit schools.